With HubSpot’s annual pilgrimage of inbound marketers having come to an end, I wanted to highlight the last major piece of founder’s Brian Halligan and Dharmesh Shah’s keynote. 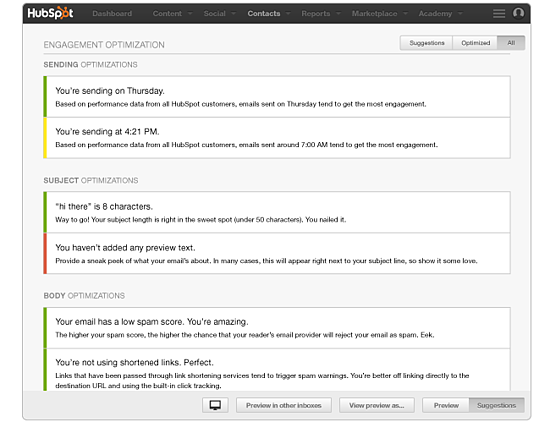 As a reminder, I reviewed HubSpot’s potential CRM game changer on Tuesday, and their nifty sales enablement tool, Sidekick, yesterday. Additionally, if you haven’t read my overview of marketing automation platforms (MAP) in general, I encourage you to read this post. The enhancements that HubSpot announced to their industry-leading platform only promise to increase the gap between HubSpot and other vendors. They realize that in a world as competitive as MAPs, there’s no time to rest on your laurels. While at first blush, the five enhancements may not seem to be much, the reality is that all of them continue to move the ball forward allowing marketers to personalize and contextualize the experience of their visitors, prospects and customers. 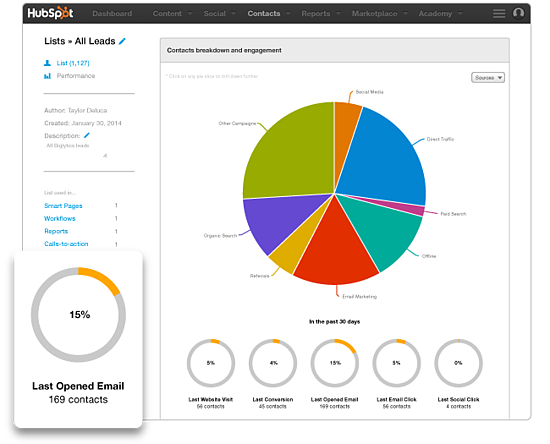 The first enhancement to review is the new calendar feature, allowing organizations to plan out their editorial calendars, map campaigns and simplify the entire project management part of the inbound marketing process. The second biggest challenge of successful inbound marketing (second to the creation of compelling content) is finding the balance between effective strategy and too much complexity. The more you try to do, the more complex the process becomes. Keeping everything in its place and on course is tough, and often leads to doing less. 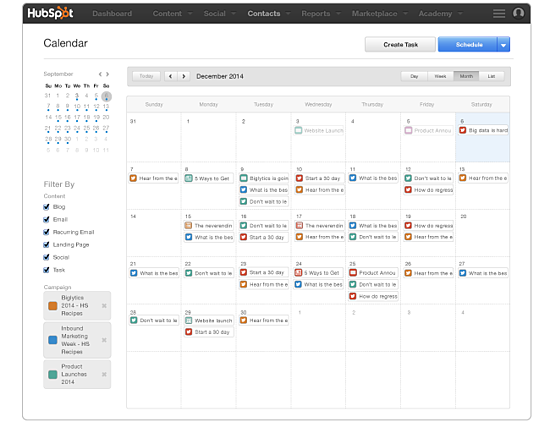 With HubSpot’s calendar, managing complex campaigns has become far easier and less disruptive. Now, there’s a single tool that keeps everyone on point. Anyone involved in any type of marketing (or sales) knows how important “the list” is. Yet, while people acknowledge the importance, very little time is spent ensuring that a list is current and accurate. On average, a list deteriorates at a rate of 23%/year (source: HubSpot), so it must be constantly managed. Additionally, today’s good list may be tomorrow’s average or bad one. Knowing how a list is performing is crucial to effective lead nurturing and to improving and enhancing results. The problem is that assessing the effectiveness of a list (let alone tens of segmented lists) can be quite burdensome. In the immortal words of Jacques Cousleau, “Not Anymore!” The List Analytics feature is quick, simple and easy to use, while providing great insights into the performance and effectiveness of your lists. Keeping track of the growth of lists, as well as the engagement is as simple as clicking a button. The intelligence it provides will ensure that you’re constantly optimizing your efforts to maximize results. As inbound marketing programs continue to gain momentum, staffing them effectively is a major challenge, as well as ensuring that all actions are in alignment. 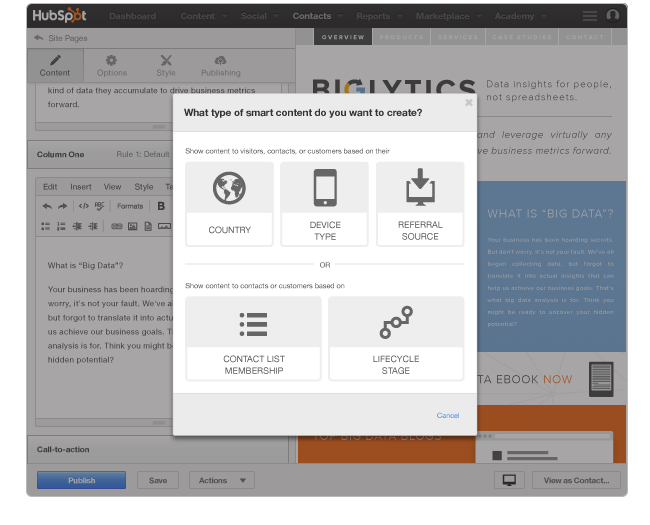 Several months ago, HubSpot introduced their Blog Optimizer tool that ensured the content you were creating on your blog followed best practices and supported your strategy. With their latest release, that same ability has been brought to email. Now it’s easier than ever to ensure you’re maximizing your deliverability rates. Getting someone up and running on the tool is quick and easy. The optimizer also allows you to check any compatibility issues for the variety of email readers that are out there. The biggest news at last year’s Inbound conference was the ability to personalize the web experience for your visitors based upon anything you knew about them and had stored in your database. The problem was that if a visitor wasn’t in your database, there was nothing you could personalize. With the latest release, you can personalize on several categories even if the visitor isn’t in your database. This allows you to create even more context and enhance conversion rates. Effective lead nurturing is critical to aligning sales and marketing and managing leads. In a webinar I recently did for one of our partners, I talked about the power of decoding a prospect’s “digital body language.” The ability to design your nurturing programs based upon the actual behavior of your prospect is one of the most powerful actions any marketer can take. 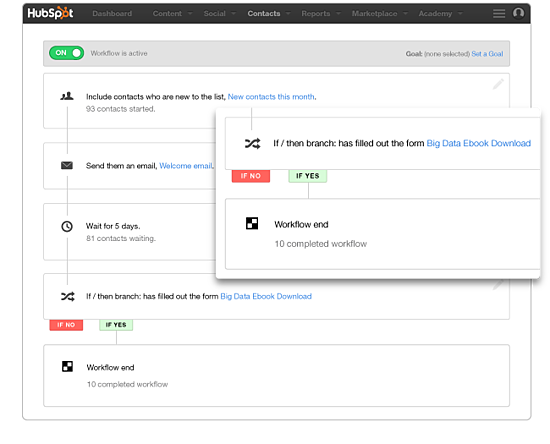 Up to now, however, you could only apply very simple logic to campaigns and workflows. With branching logic, you can now apply “if, then” statements to your workflows. This allows you to further personalize the journey for each of your prospects, while keeping the implementation process manageable. With these enhancements, combined with the new sales tools, the ability to take sales and marketing alignment up a level has been discovered. The resulting opportunity is greater efficiency and effectiveness. Now, I can’t wait for what they announce at Inbound 2015.